This is another photo that I took on March 21 at Long Hill Gardens. 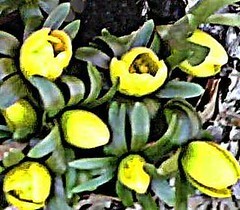 I saw these tiny yellow flowers and took a picture with my new phonecam. It takes lower resolution pictures, like my first phonecam did. In this case, the focus was a bit too soft, so I opened the image in Painter IX and sharpened it a little. I also used a little pastel to eliminate a couple of brown tips on the leaves. I started wondering how this image might look as a posterized photo or perhaps a digital woodcut. To be continued. . . . I took this photo back on March 21, during a walk at Long Hill Gardens. It was warm enough to walk and I was happy to see some crocus in bloom, so I took some pictures with my new phonecam. Tonight I finally tranferred the photos into my computer and edited them. The sunlight was very strong in the original photo, so I adjusted the contrast. I also used some gentle color overlays in Painter IX to reduce the amount of white highlight on the blossoms. I also used color overlay and some digital pastel on the leaves, making the flowers stand out more against the background. Then I posterized the image, and here it is. 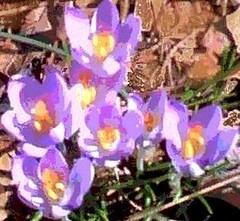 The crocus is such a hopeful flower, appearing among old leaves or even snow. But like hope itself, the crocus is sometimes hard to see. I thought it was worth the trouble to make the crocus a bit more visible. This is the photo that I posted yesterday, but this version is posterized with Painter IX. I also used the "magic wand" selector and a little bit of color overlay to add some color to areas of the sky that went too white when I posterized the image. This captures the experience of March north of Boston: still colder than you want it to be, but with promise of warm days ahead. 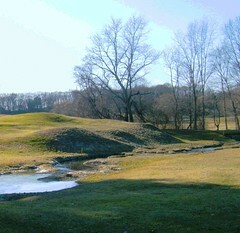 This is another photo that I took at the local golf course (Beverly Golf and Tennis). I was trying out my new digital camera. This image is cropped from the original photo. I also had to adjust the contrast to avoid the darkest shadows. It was cold that day, but there was a hint of spring in the sunshine and a bit of green in the grass. 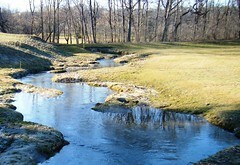 This is a posterized version of the photo that I posted yesterday, a little wandering stream on the golf course at Beverly Golf and Tennis. The posterizing is subtle here, but I like what it does to the colors and shapes in the water. 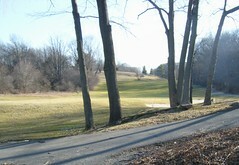 This is another photo that I took during a walk at Beverly Golf and Tennis a few weeks ago. I was very excited to discover such a beautiful place to take walks. The afternoon light was amazing. The weather was warming up a little bit, and the thin layer of ice on the stream was starting to melt here and there. This is a piece of digital art that I made recently. (See post for March 18th.) 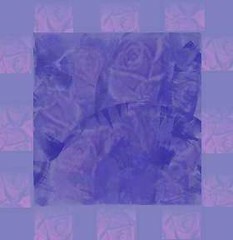 I used Painter's pattern pen and a pattern based on one of my photographs of a rose. Last week I printed it out on good paper, and today I framed it. I used the small birch frame that each Red Brick artist was asked to fill with a small work for the upcoming art auction. The work itself is four inches square. This is the fourth and last of the prints I made last Thursday night in printmaking class. For this one, I just used one color. I applied the color all over the plate with a brayer, and then used a stump and pieces of cardboard to remove pigment, carving out the image of mountains and moon. This little series of prints is inspired by the Rocky Mountains of Colorado, my home state. 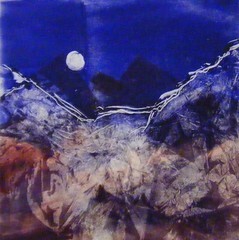 This is the third print that I made last Thursday night during the printmaking class I am taking at Red Brick. After making each print, I cleaned off the plate and start over with a new image and fresh ink. But for each print, I was using progressively less pigment. (We are using oil paints as ink.) I labeled this one "mixed media" because after I printed this image, I applied some additional paint directly to the paper. This is the second print that I made on Thursday night in my printmaking class at Red Brick Studios. I used some embossed foil paper to create texture, and used string to create the lines near the bottom of the image. I have seen this red color in the mountains of Colorado, my home state,, as in the Red Rocks Ampitheater near Denver or Garden of the Gods in Colorado Springs. In fact, Colorado is named for the red color of the rocks and the soil. Last night was the second session of the printmaking class I am taking at Red Brick. To be more specific, the class is about making monotypes. This is the first of several prints that I made last night. 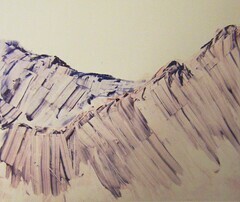 I love to paint the mountains, and using familiar subject matter lets me focus on learning a new process. (I grew up in Colorado and can draw mountains from memory and imagination.) 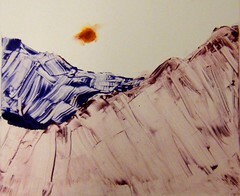 In painting, mountains are great because they offer opportunities to play with line and texture. I thought this would also be true in printmaking. 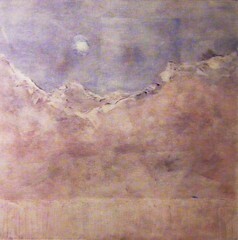 In this print, I created textures with the brayer, a palette knife, and Saran wrap. It was fun to see how the print looked when it came out of the printing press. I used Painter IX to make a posterized version of the photo I posted yesterday. This is a picture taken on the golf course at Beverly Golf and Tennis Club on an afternoon in March. I took this photo last week during a walk at the Beverly Golf and Tennis Club, a public golf course in Beverly originally established to provide recreation for employees at the nearby factories called "The Shoe" (United Shoe Machinery Company), now the Cummings Center. I often see the golf course when I walk all the way around the Cummings Center Pond. I have even attended events in the clubhouse, but this was the first time I ever took a walk there. I was surprised at how big it is (and I only saw a little bit of it), and how beautiful, with little paths and brooks and bridges. It was late afternoon and the light was great, so I started taking pictures with my new digital camera. There was a still a little bit of ice left on the ground, but I thought that it was beginning to look a bit like spring. 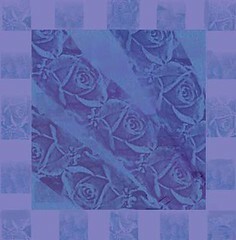 Last night I tried one more version of the blue roses pattern I have been working with over the past few days. 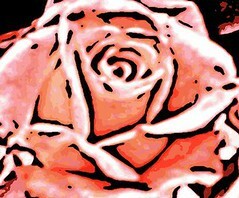 (To make this digital art, I used my photo of a single rose to create a digital woodcut. Then I made a pattern from the digital woodcut, using Painter IX software. Then I used a pattern pen in Painter IX to create this image.) This time I was happier with the composition of the inner square. 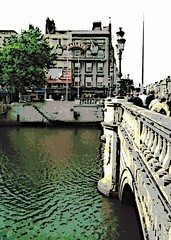 This image began as a photo that I took in Dublin during a trip in July of 2004. It is a great souvenir of Dublin, and across the river, you can even see a sign for Bailey's (one of my favorite Irish exports). It took me until March 5 of 2005 to post the photo. Last night I was looking through my pictures of Ireland and came across the photo again. I decided to see how it would look as a digital woodcut. I used Painter IX with a color set, resulting in a bright green river for March 17th! I worked on this image last night and again today. It is similar to a piece that I posted on March 10. Both are made with Painter IX's pattern pen, using a pattern made from a "digital woodcut" of a rose. Although I like the March 10 version, I returned to the idea to see if I could come up with different composition for the inner square. In addition to the pattern pen, I used some color overlays and some digital pastel. 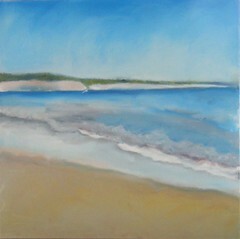 This is another candidate for the upcoming art auction at Red Brick. 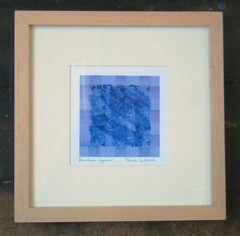 Each artist at Red Brick has been asked to fill a small birch frame with an original piece of art (4 inches by 4 inches). In the end, I may use some other image, but having an "assignment" like this is great because it gives me a problem to solve and encourages me to create something new. 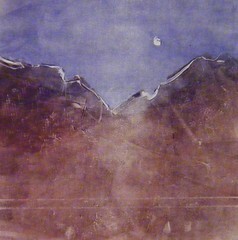 Here is the second print that I made last Thursday night in printmaking class at Red Brick Studios. I used the same plate as with the first print (see yesterday's post), but reapplied the oil paint that we are using as ink. This time I used less ink and a slightly different texture. I decided to try the print without the sun, so I cleaned off that part of the plate before I printed the image. I am taking a short class on printmaking at Red Brick Studios. The class meets once a week for three weeks, and the first session was yesterday. I have had very little exposure to printmaking, and the little experience I have had took place several decades ago! So it is fun to learn something new. I wanted to concentrate on learning this new process, so I used familiar imagery: mountains from my memories of my home state, Colorado. 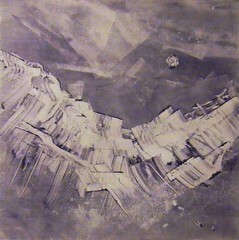 We used oil paint as ink, and for this image, I used pieces of cardboard as a brush. Then we ran our plates through a press. I was happy with most of the image when I pulled it off the plate, but the sun had become a blob. (I had too much pigment on the plate, and I didn't think about how it might spread under pressure.) But I liked the rest of the image, so I used a brush and a little more of the oil paint to fix the sun, which is why this image is labeled mixed media. 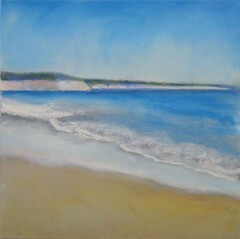 This is an oil bar painting of Singing Beach in Manchester-by-the-Sea, in Massachusetts. Today I went to the studio to work on this painting for a while. I straightened out some of the lines that were bothering me, and added some bright white to the waves. I also added more definition to the land formation in the background. At this point I am happy with how it looks, and am thinking I might donate it to the Red Brick Auction, which takes place at the end of March. Today there was a reception for my art show in Manchester, New Hampshire, at the UNH Graduate Center. 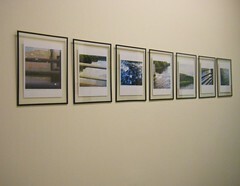 My oil bar paintings and posterized photographs of the mills and river in Manchester are on display up there. Although I knew how the paintings were hung, I hadn't yet seen the photographs up on the wall because someone at the university hung them for me. I was happy with the result. I used floating frames so the wall shows through the glass and functions as a mat. Here is a photograph that shows how the display looks. This image began with a walk yesterday at Long Hill Gardens. It was cold and I was surprised to see forsythia blooming, even though I have been waiting for spring. Forsythia blooms in very early spring, sometimes while snow is still on the ground, much like the crocus. I liked the brightly colored branches in the sunlight, so I used my digital camera to take a picture. 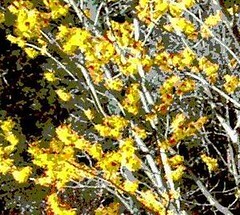 Today I transferred the image into my computer, cropped it, and then posterized it in Painter IX, choosing a level that emphasized the sunny yellow blossoms. 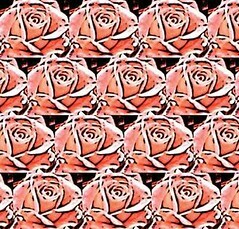 Last week I made a digital woodcut using a photograph of a single rose, and then made it into a pattern. (See post for March 6.) For the past two days, I have been using that pattern to create this little compositional exercise. This was done in Painter IX, using the pattern pen in a variation that picks up the shapes in the pattern, but not the original color. I was curious to see what would happen with a pattern based on a woodcut, and I was pleased with this because the dark lines of the woodcut make for a strong pattern. In addition to the pattern pen, I used color overlay and a bit of digital chalk. At first, I used a plain border, but I like the added complication of the geometrical design, still using the rose pattern but in a different color. For the upcoming art auction at Red Brick, everyone is supposed to do a small piece of artwork in a square format. The theme of the event is "Cool Blues", and it just now occurred to me that this piece might work. 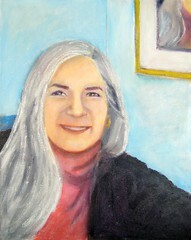 While I was in the studio the other day to start my painting of Singing Beach (see yesterday's post), I took a few minutes to even out the color of the turtleneck in my self-portrait. Then I began to seal the edges (paint the bare canvas around the sides). I can still see little things I might like to fix, but I am ready to say that this is basically the portrait, as it is here. Friday morning (yesterday), I went to my studio at Red Brick to get this painting started. This is going to be a painting of Singing Beach, in Manchester-by-the-Sea, which is a short drive up Route 127. When I left for the studio, I made sure I had the printout of the photo I am using for reference (posted yesterday). My goal on Friday morning was just to block in the basic shapes and colors of the composition. I drew the composition in freehand with a gray oil bar, and then started blocking in some color, using the oil bars directly on the canvas and then blending. I added more detail to the ocean than I had intended, because no doubt I will have to move things around in this landscape. Although I think I made a good start, there are some issues with the perspective that are going to need some attention. To be continued. . . . 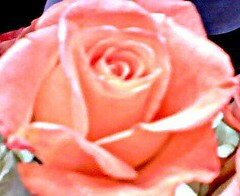 This is a photo that I took back on April 2 of 2006, using my first phonecam. 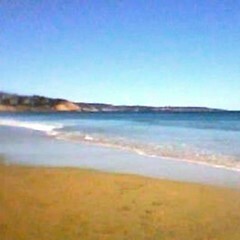 This is an image of Singing Beach up in Manchester-by-the-Sea, a lovely little town a bit north of here on Route 127. I came across this photo last night while I was looking for inspiration for my next project. If I can, I want to paint something new for Red Brick's art auction at the end of March. The theme is "cool blue" so I was looking for an image to use when I found this picture. I like the idea of using local subject matter, and there are certainly a variety of different blue colors in this photo. So I cropped the image to get a square format and decided to base my next painting on this image. I printed out a copy to take to the studio. To be continued. . . .
Tonight I used the digital woodcut that I posted yesterday to make this pattern. This all started with a phonecam photo that I took last weekend at BJ's Wholesale (and posted two days ago). Tonight I opened the image in Painter IX and used the "capture pattern function". Then I used the pattern to make the image that you see here, adjusting the size of the repeated image as well as the direction and amount of the offset. I saved the basic pattern so I can use it again in other ways and in other images. This is a digital woodcut that I created at the computer, using the photo that I posted yesterday (taken with my new phonecam). I opened the photo in Painter IX and adjusted the amount of black line. I was trying to leave enough black line to emphasize the shapes of the petals, without overwhelming the delicacy of the rose. This is another of the photos that I took on Sunday while I was trying out the camera in my new Blackberry Pearl cell phone. I moved in close to get this picture of a single rose, chosen from many on display at BJ's Wholesale Club, where I took this photo. Today, at the computer, I adjusted the contrast, cropped the photo just a bit to get this composition, and then opened the image in Painter IX and sharpened the focus just a bit. I thought this image had potential for things like posterizing, digital woodcut, or perhaps a pattern. To be continued. . . .
Today I went to the studio to work on this painting. Although I haven't had an chance to work on this painting since February 19th, I have been thinking about it and planning what I wanted to do next. So today I began by moving the chin line up just a bit and making the jaw a little bit rounder. (This meant doing a bit of repainting on the neck and collar as well). 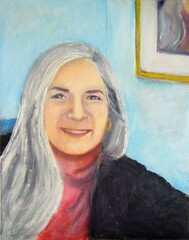 Then I added more white and pink to the skin tones, using a small brush and blending in the strokes. I was trying to get the effect of a glaze. My goal was to soften some of the shadows and lighten some of the strong yellow and ochre tones. I also managed to open the mouth up just a bit by lightening some shadows on the teeth. I made a few other minor changes, just a mark or two really. But then I decided that it was time to step away from the canvas, because with more changes, I had much more to lose than to gain. Last weekend, my Nokia phonecam was destroyed in an unfortunate avalanche that took place in my coat pocket while I was out shoveling snow. It took nice sharp pictures, and I struggled this week to find a comparable replacement. I now have a Blackberry Pearl, and the model available isn't as high resolution as my Nokia and is trickier to use, though it has a zoom and some other great features. But after looking at options all week, I decided that it is the best choice I can get with my carrier, so I decided to keep it. I recently got a great new digital camera, as small as a cell phone, that I can use for high resolution. (With a back-up battery and a case with a clip, the digital camera will have the same portability and spontaneity as a phonecam.) And I will use the Blackberry to get those nice soft images that I grew to love when I had my very first (very low res) phonecam. The image of roses posted here began with a photograph that I took with my new Blackberry Pearl while I was still trying to decide what to do. 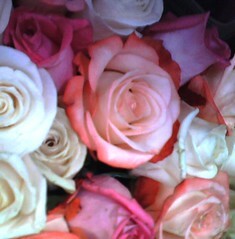 I was at BJ's Wholesale Club, saw roses on display, and took some pictures to try out the camera. I took the photo without zoom and worked hard to hold the camera still (which isn't easy because the shutter control is a trackball). Later, I transferred the photo into the computer, cropped it, and adjusted the contrast a bit to get this image. This picture of wholesale warehouse roses, taken with a phonecam that I was about to return, helped me to decide because it reminded me that what I have to work with matters a lot less than how I think about what I have, and what I choose to do with it. I was in Cambridge yesterday to get together with old friends from Chicago who were visiting. They were admiring the building opposite the Harvard Bookstore on Mass Ave. That made me think of the image I posted yesterday, a photograph that I took of that building back in December of 2006. (The building is a Harvard dorm, and you can get a peek at the campus through the archway.) 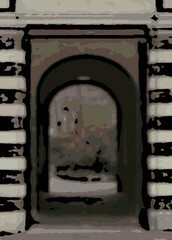 Back on December 27, 2006, I had cropped a closeup of the archway taken from that photo, which I then posterized and posted here. Today I decided to try the same image as a digital woodcut, so I opened it in Painter IX and adjusted the controls until I got the effect that I wanted.